It’s a marriage proposal presented as a “live lip-dub” of Bruno Mars’ “Marry You“. Basically a live music video, staged on a quiet street in Portlandia, from the back of a slowly moving car. I watched probably 10 times today and it still brings a big smile to my face. It’s an incredible, touching, creative work, pulled together by a large cast of friends & family. It’s really something. And in the past few days, it’s been viewed a combined 2,000,000 times on youtube and vimeo. Is the wedding proposal fair use under US copyright law? Or is it infringing? I’m not an expert on this, but my read is that it’s not fair use and therefor is infringing. Who knows if the creators cleared the rights to the song, probably not. But this is a) such awesome creative work and b) nothing but positive towards the brand and market awareness for the song itself. Even if you don’t believe this should count as fair use, it’s the kind of thing where a more accessible / understandable rights clearing & licensing system would really make things easier and foster more creativity like this. 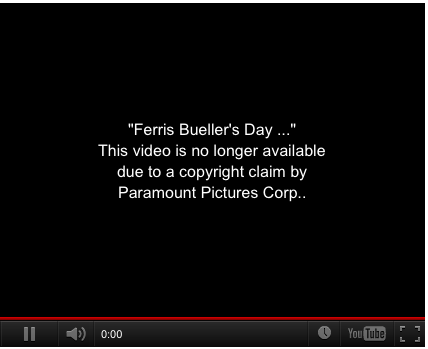 I’m pretty sure the Ferris Bueller clip is infringing. I was able to find the clip I included above, but I assume that might disappear at some point as well. Which is unfortunate, because as matter of culture, it’s really helpful to link to clips like this. I don’t know if there would be a reasonable way to provide the raw material (the way that youtube does, sort of) which would, under current law, facilitate fair use while limiting non-fair use.